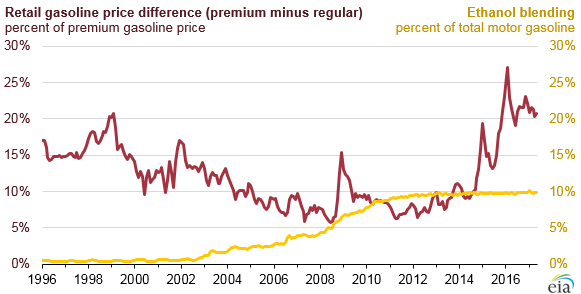 The difference between U.S. average retail prices for premium and regular gasoline reached 50 cents per gallon in late 2016, and it has remained near that level so far in 2017. This price difference, or spread, has been generally increasing since 2000. Many factors on both the supply and demand sides are influencing this trend. One of the main performance characteristics of motor gasoline is octane, a measure of gasoline’s resistance to spontaneous combustion. In the United States, retail gasoline is usually classified by its octane rating: regular gasoline with a typical octane rating of 87 is the least expensive option, and premium gasoline with a typical octane rating of 91 to 93 is the most expensive option. The price spread between the two grades of gasoline is most often representative of the cost to produce the additional octane. On the demand side, the premium gasoline share of total motor gasoline sales has steadily increased in recent years, reaching a high of nearly 12% in August 2016—the highest share since 2004. 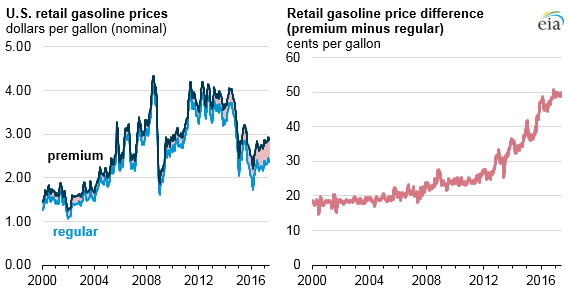 Although lower gasoline prices may be making premium gasoline more affordable, thereby encouraging demand, the upward trend in premium gasoline sales is more likely driven by changes in fuel requirements for light-duty vehicles in response to increasing fuel economy standards. To meet these standards, more car manufacturers are producing models with turbocharged engines that may require or recommend the use of high-octane gasoline. This long-running trend has occurred at the same time as costs to produce and supply octane for gasoline have increased. Energy policy reforms in recent years have promoted the widespread use of ethanol as a source of octane in gasoline, replacing previous octane sources such as tetraethyl lead and methyl tertiary-butyl ether (MTBE). However, there is limited demand for, and challenges associated with, blending ethanol into gasoline in concentrations greater than 10%. Ethanol inputs as a percentage of total gasoline consumed approached 10% in 2013 and have since plateaued, even as the demand for higher octane blends increased. The combination of increasing demand for premium gasoline and market challenges to further increases in ethanol blending has led refiners and blenders to acquire more expensive sources of octane, leading to an increase in the price differential between premium and regular gasoline in recent years. Beyond ethanol, other sources of high-octane blending components are produced by downstream units at petroleum refineries. Although total distillation capacity has increased in recent years, there has not been a corresponding increase in the capacity of refining units that produce high-octane blending components. Other factors affecting octane and motor gasoline are examined in EIA’s latest This Week in Petroleum. The 2017 EIA Energy Conference will be held June 26–27 in Washington, DC. Registration to the conference is open through midday on June 23.